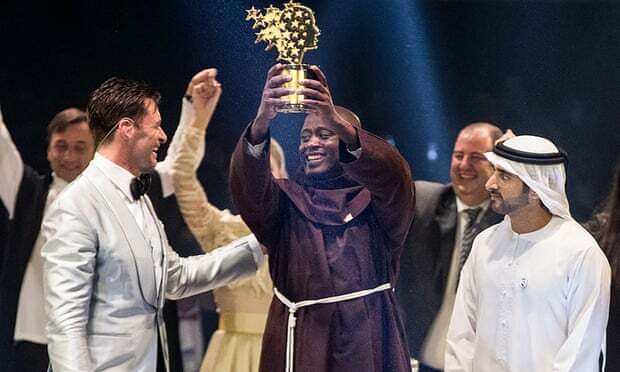 DUBAI, UAE – Mr. Peter Tabichi, a Mathematics and Physics teacher from a secondary school in a remote village in Kenya’s Rift Valley has won the $1 million (about UGX3.7b) Global Teacher Prize for 2019, BBC has reported. Mr. Tabichi, 36, of Keriko Secondary School in Pwani Village won the Varkey Foundation Global Teacher Prize 2019, beating 10,000 nominations from 179 countries. He becomes the first African to win the prize. The BBC has also reported that the youthful teacher is known for donating a high percentage of his salary to help poor students. Mr. Tabichi, a member of the Franciscan religious order, received his prize at a ceremony in Dubai hosted by actor Hugh Jackman. He gives away 80% of his income to help the poorest students at the poorly-equipped and overcrowded rural school who could not otherwise afford uniforms and books. More than 90% of his pupils are from poor families and almost a third are orphans or have only one parent. Drug abuse, teenage pregnancies, dropping out early from school, young marriages and suicide are common in this area. Learners have to walk 7km along roads that can become impassable in the rainy season to reach the school and the area is always affected by drought and famine. Despite only having one computer, a poor internet connection and a student-teacher ratio of 58:1, Mr. Tabichi started a “Talent Nurturing Club” and expanded the school’s Science Club, helping pupils design research projects of such quality that many now qualify for national competitions. Mr. Tabichi and four colleagues also give struggling pupils one-to-one tuition in Maths and Science, visiting students’ homes and meeting their families to identify the challenges they face. Mr. Sunny Varkey, founder of the Varkey Foundation, said he hoped Tabichi’s story would encourage others to enter the profession and “shine a spotlight on the truly inspiring work teachers do to make tomorrow brighter than today”. Mr. Tabichi said Africa’s young people would no longer be held back by low expectations. Last year’s prize went to an arts teacher from north London, Mr. Andria Zafirakou.